The Farmer’s Carry can be used to train core stability, grip strength, balance, and coordination. Usually it’s done lifting odd objects like yokes, water filled pvc’s, sand filled kegs, or any other heavy objects lying around the gym. Today we’re carrying the Erg. Ensure you keep a solid core and let us know what you think is the most efficient way to carry an erg 100 meters! It’s starting to get cold, but if you can get outside and you have an area to walk 100m with the erg then do it! Otherwise you can sub a farmer’s carry with kettle bells in each hand. 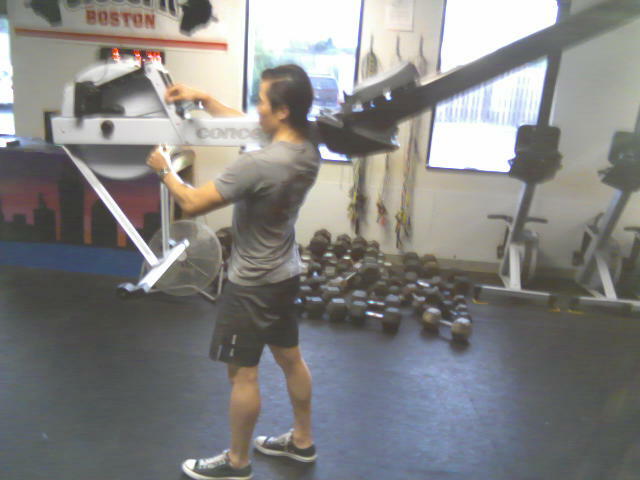 The goal for each 1k Row should be to hold your average split for 2,000 meters plus 1 or 2 split seconds. In other words, row each piece at a pace of 2k+1 or 2k+2. Be consistent and work on improving one aspect of your form during each round. Use this as an opportunity to test out the Undefined Rest feature on your Performance Monitor. Select Intervals Distance, set the distance for 1,000m and then set the rest to “Undefined Rest”. This will give you a running clock for the whole workout and allow you to sit down and row 1k each round without having to mess with the monitor. If your monitor doesn’t have this feature you’ll have to use a stop watch. Check here to find out how to update this feature on your monitor. Post your time and splits. Let us know how you carried the erg! This entry was posted in Fitness, Rowing, Strength and tagged endurance sports, exercise, functional movements, health, new sport, rowing, sports, training by Renegade Rowing. Bookmark the permalink.